The plot could have used a little work. What are the secrets of the Sanjiyan race? Why does Pai want to become human? What happened on that night Pai faced Benares? All these answers and more slowly bubble to the surfaces as the second 3×3 Eyes OVA series progresses. Set 4 years after Pai's battle with Benares, the story begins as Yakumo continues his never ending search to find Pai. His only lead up to this point has been the fact that he is still alive which means Pai is still alive, somewhere. But, one day he picks up an issue of a Peach Time and notices a girl posing for pictures in her school uniform, a girl who just happens to be a dead ringer for Pai. As fate would have it Pabo and her friends are out on the town and come across Yakumo. He glances up from his magazine to see the girl in the picture standing right in front of him so he quickly gets up and rushes towards the girl, putting his dingy arms around her. She screams and runs away into an ally. And whenever Yakumo is around there is bound to be lots of trouble. But, is all this pain really worth it for a girl that just happens to look like Pai? Sure it is, especially since the girl has three strange scars on her forehead. Composed of three 45-minute episodes, the second OVA series gives a lot of answers, a lot of action, and a lot of plot-twist. But, the one thing it doesn't give is a visually-numbing final battle. As with episode 4 of the first OVA, the final battle is only portrayed as a burst of light with a lot of lead-up and vague dialogue at what came after. Though, this does make you want to read the manga, it doesn't offer much in the way of a conclusion. Especially since the one thing that was missing from the show is what drove the first OVA along; the Pai we know and love. Yet, through it all the show still stays true to the manga. As the series progresses we are introduced to the American treasure-hunter, Jake McDonald (who just happens to be an obnoxious version of Indian Jones), a series of monks who worship and protect Sanjiyan artifacts, and a ton of unique and bizarre demons who cause nothing but pain and massive blood-loss from Yakumo. But, even all these characters can't help the blandness of the animation. The look of the characters can best be compared to the animation differences in the two Tenchi-Muyo! 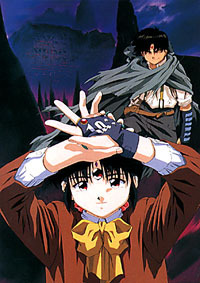 OVA series. While the first series was high-quality and featured intricately detailed characters and backgrounds, the second series sports rounded and often comical versions of characters who are supposed to look menacing. Another problem with the animation is the settings are almost always well lit, as apposed to the very dark settings in the first series. This difference seems made up for by throwing in tons of action sequences and gallons of red blood that gets splattered, sprayed, and spewed everywhere. But, the one thing I can't complain about is the voice acting stays consistent with the previous volume. What's more is that the supporting cast, for the most part, sound completely new. Which is a good thing considering the four year gap in the story, it makes it more believable in a way to have different voices for the non-main characters. But, overall it's a fitting continuation and definitely shouldn't be missed if you want to know more of the big picture. Just don't expect a perfect ending. This series is definitely for anyone not brave enough to check out a manga series that's been regularly published since 1987, this is the perfect way to go. Especially since all seven episodes are now fully available uncut and unaltered for the first time in English.